When I was six years old I remember accompanying my mother to a support group for divorced parents. As she went to meet with the group, I was ushered to a play area nearby with a couple of other children. We sat and made the usual small talk you make as a six-year-old, and, at some point, we went to pull out the snacks our parents had packed for us. The young boy I was sitting next to unzipped his shiny red vinyl lunchbox and pulled out a massive homemade Rice Krispies® Treat covered in plastic wrap. I unrolled my brown paper bag and pulled out a sandwich. I opened it up and found nothing inside but mayonnaise. I looked over at his snack longingly and happened to make eye contact with his mother as she gestured and mouthed the words, “Split it with her,” to her son. He asked me what I had, and I sheepishly took a bite of my sandwich and put it back in the bag, refusing his offer for a half of the treat he was about to enjoy. I wouldn’t ever say that I grew up poor. However, the first few years after my parent’s divorce were hard. My dad was working to pay off mountains of debt accrued during the divorce while trying to finish his bachelor’s degree. My mother, grappled with mental illness. Unable to hold a steady job as a paralegal as she had in the past, she often waited tables or delivered pizza. I always had food, shelter, and access to necessities, but little luxuries were not a priority. Occasionally, I would get the rare reward of bringing a Lunchable to school. We spent a lot of time back-to-school shopping at thrift stores. It was an odd feeling to know that the other kids at school bought their clothes brand new, at the mall and not Wal-Mart. I laugh at a picture of myself in 3rd grade, where my bangs are so long I can hardly see, and my pants so old that they looked more like capris than boot-cut jeans. I remember by dad teaching me how to clean my tennis shoes with a toothbrush so that they would look newer. Fast forward to high school, then college. Our financial position changed greatly once my dad earned not one, but two degrees. We had overcome the debt previously accumulated, and things were good, great even. I saw myself among my upper to middle-class peers and felt that, finally, I was one of them. But that is not the moral of this story. This is not a classic American narrative of “pulling yourself up by your bootstraps;” this is about what came next, something that I feel deeply ashamed about, and am consistently struggling to rectify. I am not financially literate. You see, when we finally had the means, my father gave freely to me, making up for the years of cleaning tennis shoes with a toothbrush, and first-day-of-school outfits purchased at thrift shops. He did whatever he could to make my life as comfortable as possible. I spent the next 10 years and counting relying almost solely on my father for all my financial needs. Sure, I worked a part-time job from time to time, but I never had to earn a wage to live on and wasn’t under pressure to do much more than be a student. But what I have found is that dependency, and that lack of understanding of financial literacy, has literally crippled me. I still don’t know how to save well and often live paycheck to paycheck. It is not uncommon for me to get to the end of the pay-period and have my bank alert me that $1.87 is the remaining balance in my account. I always tell myself, “You pay your rent and your car payment. You are putting away some money for retirement. You’re fine,” repeatedly trying to reassure myself that I have time to figure out this whole finance thing and that it will all work out. The reality is, I am petrified. Marriage has a lot to do with that. It’s all well and good until you suddenly have a partner, and you want a house and maybe even children. You’re both thinking about the future and it all comes crashing down with the realization that you are in way over your head. It is overwhelming to think of living life on my own, with little understanding of how to manage my own money. For someone who experienced financial instability for a good portion of my life, I sometimes feel that I live within this alternate reality that I escape to when faced with the pressure to finally be an adult. I am constantly running away from the image of a little girl in worn-out tennis shoes, eating a mayonnaise sandwich. I don’t relate this as a sort of humble brag, but rather to say: Even if you think you have it all figured out, you don’t. Even if you have access to education, a supportive partner, and a generous Dad, you don’t have it figured out. I know I have to change or I may once again be eating mayonnaise sandwiches, or even worse, impacting those I love the most. Rather than continuing to mentally escape, I’ve chosen to address it. I don’t have 10 steps to financial freedom to share with you, or a guide to help you be more financially literate, but what I do have is practical life advice. If you feel ashamed about your lack of knowledge about money, you are not alone. If you feel that you aren’t preparing for your future enough, you are most likely correct. If you are 28, 35, 40, or even older, it is never too late to make a conscious decision to become more informed. I am by no means perfect, but I am finally looking at my choices in life and trying each day to figure it all out. If you are in the same boat I am in, you’re not alone. 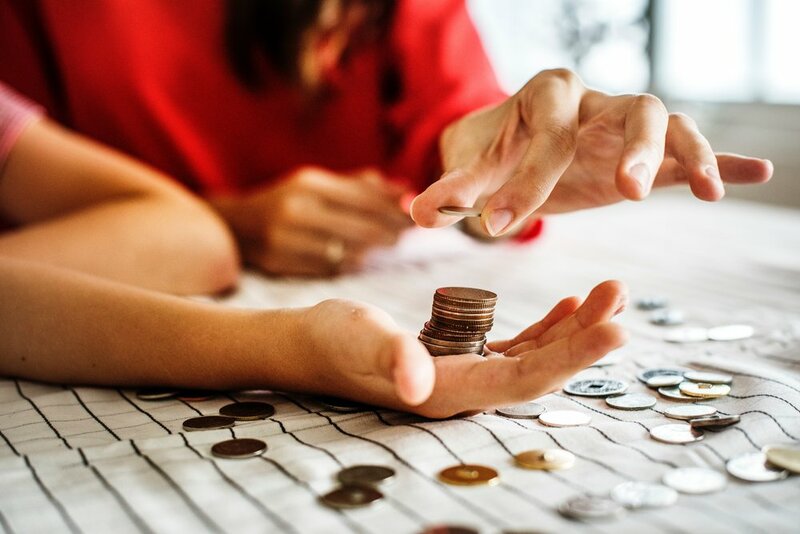 I urge you to see if your place of work provides financial planner services or connect with organizations such as Jewish Women International that provide programs to educate about financial literacy. At the very least, summon the guts to take a hard look in the mirror. Challenge yourself to believe that you are far more capable than you think you are. This month, JWI is highlighting our financial literacy programming in domestic violence shelters during Domestic Violence Awareness Month. Learn more and donate to support this important work. Shared with permission from bluntlywritten.wordpress.com (August 2018).